for the baby on the go! This carrier design was invented specifically, but not exclusively, for the working parent. The efficiency of this design enables easy storing and transporting of six baby bottles and their needs. This product will maintain them in an upright position while occupying a minimal amount of space in the refrigerator or diaper bag. Formula and diapers are expensive, leaking bottles can cost money. Opening and closing of the refrigerator door can cause bottles to tip over, leaking formula and creating a mess. Saves the aggravation of cleaning up afterwards. Leaking bottles can dampen diapers and soil the bag. 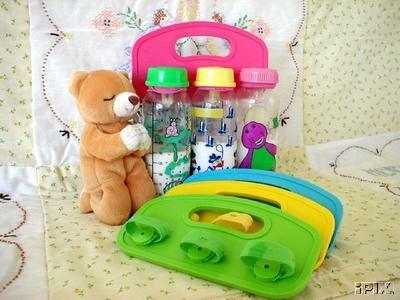 Organizes the baby's needs and transports them, bottles etc. all secure in a snap, and the ability to pick it up with one hand! The carrier rings are numbered 1 thru 6 to insure proper feeding order for the baby. All components of the BABY SIX PACK are made in the USA of safe, soft, durable plastic and elastic. BABY SIX PACK is dishwasher safe and comes in BUBBLE-GUM PINK, SKY BLUE, CANARY YELLOW, AMD PALM GREEN. BABY SIX PACK is U.S. Patented and foreign patenting rights have been granted. BABY SIX PACK MAKES AN IDEAL GIFT.